Did you know that in 2016, 5,190 workers were killed on the job? That is an average of more than 99 per week or 14 deaths per day. While a certain amount of workplace injuries is unavoidable, many of these could be prevented with workplace safety policies. These policies protect both the employer and employees, as they help ensure a safe and productive working environment. Additionally, workplace safety does not just apply to more dangerous workplaces, such as in construction, but too typical workplaces as well. Employers and employees should feel comfortable in their policies, and have rules and regulations in place for enforcing these for everyone’s benefit. Here are ten simple tips to improve your businesses workplace safety and workplace safety policy. In developing methods to get information to your employees, work closely with safety leads, human resource employees, and others to decide the best ways to distribute it. Generally, it is better to be safe than sorry in terms of workplace safety postings. Placing signs, information, tips, and resources everywhere can be an asset to encouraging it. As well, putting information at key points, such as where a first aid kit is or eyewash station, can be helpful. The more obvious, the better. Workplace safety should not only be talked about behind closed doors. It should include everyone in the workplace, towards a common goal. This can especially be useful in maintaining a clean and respectful environment, where the rules and regulations are both understood and honored. Consider hosting regular workplace safety policy meetings with your employees, and make sure it is up-to-date by allowing feedback from them. Drugs and alcohol have no place in a workplace, especially if that work is more dangerous. These substances can greatly increase the chance of injury and death, which can put employees and employers at risk. Therefore, in the workplace safety policy, establish a no-tolerance rule for any type of abusive substance during work hours, for the good of all. A reporting process is crucial to a well-oiled workplace safety policy. Without it, the rules may be difficult to enforce. Therefore, have a system for employees to report unsafe equipment or behavior in a respectful, non-intimidating way. This will help prevent future injury and death and allow employees to self-police one another for safety. Clutter can create an unnecessary hazard in the workplace, and it should be avoided as best as possible. This mostly refers to objects that have the potential to cause injury through falls, or improper storage of supplies or equipment. Always have a clean-up system for equipment, and encourage workers to keep their areas tidy. Faulty and unsafe equipment can easily can safety concerns in the workplace, and therefore they should regularly be inspected and checked. All equipment should function properly, and there must not be any missing components to it. As well, be sure to listen to any workers that complain about issues with their equipment. It is better to respond and inspect the equipment before an injury happens, as prevention is always the least expensive option. Workers should be encouraged to be aware of their surroundings at all times. There will always be unforeseen risks if an employer is not keeping an eye on others around them. As best as you can, regularly remind workers the importance of workplace safety and awareness. This may also be possible with regular workplace safety meetings or educational materials. On-site video monitoring can extremely helpful in terms of enforcing the workplace safety policy. Installing cameras throughout the workplaces to watch for potential injuries, accidents, and spills, and learn to prevent them in the future. As well, it may encourage workers to be more effective in clearing their areas and adhering to safety rules. Personal protective equipment should always be enforced in all workers. It is the most vital tip for staying safe at work. Wearing gloves, hard hats, goggles, ear protection, and body protection can prevent serious injury in most workplace environments, and therefore should be non-negotiable. The particular equipment will vary based on the hazards, but it should always be provided and worn by workers. Perhaps the best line of defense from safety hazards in the workplace is to create a culture around the workplace safety policy. Therefore, don’t pretend that it isn’t a possibility for someone to get injured because it is. As well, don’t discourage discussions of safety from your employees. In fact, encouraging feedback can be one of the best ways to keep them safe. Make sure they know that their safety is a priority and that it should be a part of every workday. An online safety training such as SafetySkills can very helpful in establishing this culture, as well as informing employers and employees about important safety information. 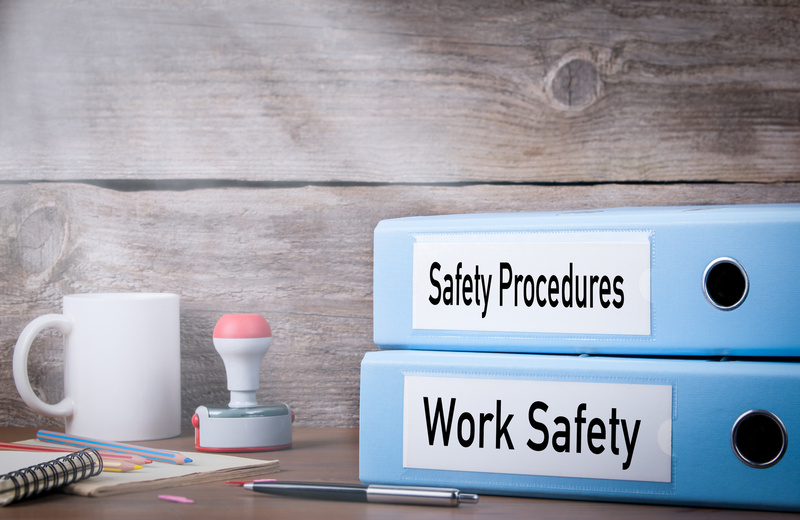 A workplace safety policy and everything that it comes with is vital to any business, and therefore should be considered regularly. There are many different tips to improve the safety policy, and considering which would be the best for the company you are in can make all the difference. Workplace safety truly can be a matter of life or death, and should never be pushed aside or treated lightly. For more information about safety in the workplace, check out our article on ten workplace safety topics your employees should know.